Hope of Glory Ministries thrift store, The Community Outlet is open Monday - Friday 9 am-5 pm and Saturday 10 am-4 pm. This store gives another alternative to families to purchase their basic necessities. We will continue to depend upon donated items that will be processed and sold at a low cost. Clothing, household items, and furniture are among the many items available to our local community. 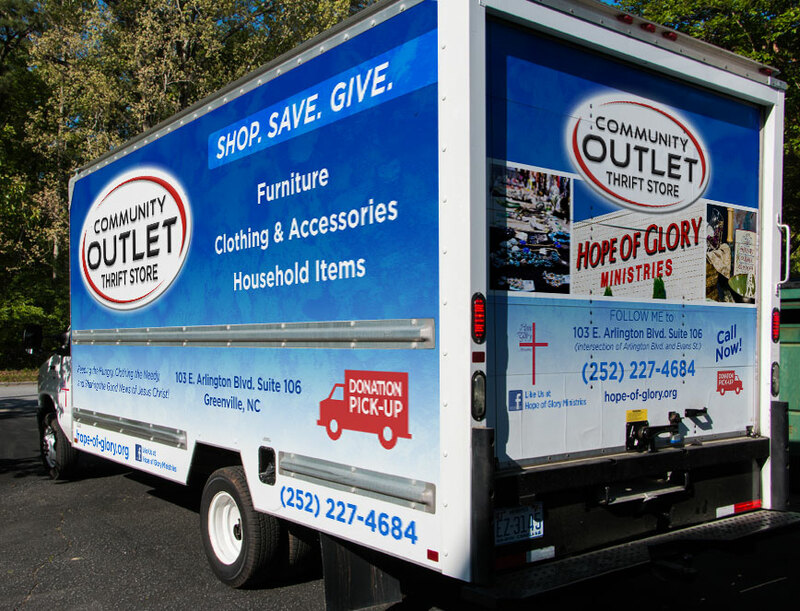 Each purchase made at the Community Outlet will provide supplemental funds to purchase much needed food for our pantry, start life skills classes, expand our discipleship ministries and support other ministry operations. As the local need for clothing and food grows we will continue to provide for those in need through the Resource Center and the donated goods we receive. As we transition and seek the Lord for His faithful discernment to minister to the whole person, we believe that the addition of the Community Outlet gives us a well-rounded opportunity to equip individuals with a “hand up” rather than a “hand out”. We would like to invite you to be a part of this exciting addition by gathering your clothes and home items to donate to our Community Outlet and Resource Center. Our drop off hours are Monday - Friday 9 am-5 pm, and Saturday 10 am-4 pm. We will pick up gently used furniture and home items. Call us at (252) 227-4684 or send us an email!